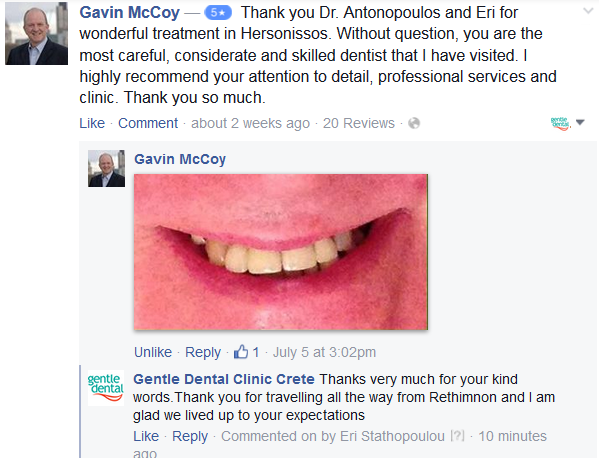 After repeated re-cementing of my upper right incisor crown due to a broken post, I decided to visit Dr. Giorgos Antonopoulos at Gentle Dental Abroad whilst on holiday on Crete. I explained that I had limited time on the island and wished to renew both central incisor crowns and revise and remove the broken post. Through his very helpful Administrator Eri, he gave me a full idea options and of the very reasonable fees involved (much lower than UK prices!) He was able to begin the work immediately on my arrival. I have to say that Dr. George is the most careful and professional dentist I have visited. He clearly has exceptional skills. His attention to detail is excellent, and he makes every clinical visit a very pleasant experience. The process was unhurried and personal. His Dental Technician visited the surgery twice to match the colour, shape and other details of my new crowns. I have to express how delighted I am with the results. The whole experience was perfect, and carried out exactly to my budget, timescale and wishes. 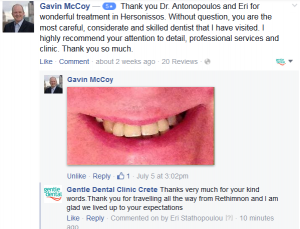 Thank you Dr. Giorgos Antonopoulos, Eri at Gentle Dental Abroad, Hersonissos, Crete.